Artist Ai Weiwei is detained as part of what some say is the biggest crackdown on activists in China in a decade. Some are calling it the worst crackdown in a decade. And this weekend, Chinese officials continued their campaign of detaining and jailing dissidents and rights activists in an apparent effort to prevent a repeat of the democratic awakenings in the Arab world. It began in the middle of February, after first the Tunisian president and then Egypt’s Hosni Mubarak had been swept from power by popular demonstrations. In mid-February a call went out on the Boxun website for China’s own Jasmine rallies, a call that was met with a show of force in Beijing and elsewhere at designated rally points as security forces swarmed the areas. 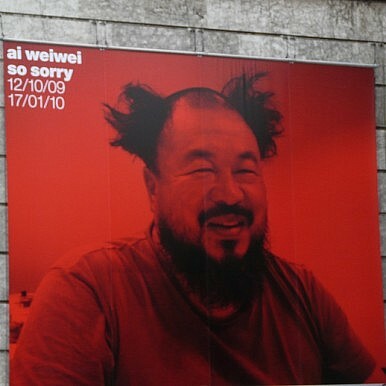 And now high-profile artist and activist Ai Weiwei has apparently joined the ranks of the detained. The Sydney Morning Herald reports today that Ai was held at Beijing airport yesterday before he was able to board a flight to Hong Kong. An immigration officer is said to have told one of his assistants that Ai had ‘other business’ and so couldn’t board. ‘Between 15 and 20 uniformed and plainclothes police surrounded his home and studio in Caochangdi, in the north of the capital, and one of his assistants told the BBC it had been searched and a number of people who work for him had been taken to a local police station,’ the paper reported. This isn’t Ai’s first run-in with the authorities. In 2009, after conducting his own investigation, he created a public list of the names of over 5,000 children that were killed in the 2008 Sichuan earthquake after the government had refused to disclose the number of lives lost. Ai was reportedly beaten by police and suffered a brain hemorrhage. More recently, in January this year, demolition workers tore down Ai’s Shanghai studio in a move apparently linked to his political activism. It’s hard to believe that this is the same artists who is perhaps most famous for designing the Beijing National Stadium, the ‘Bird’s Nest.’ The structure was the centerpiece of the 2008 Olympic Games and was seen as symbolizing a modern China. It’s an irony that will be bringing Ai and others little comfort now.